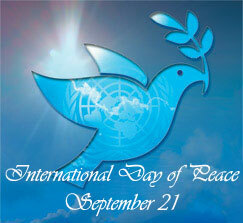 The United Nations‘ International Day of Peace, also known as the World Peace Day, marked every year on September 21, is a Global Movement when individuals, communities, nations and governments highlight efforts to end conflict and promote peace. It is observed by many nations, political and military groups, and expressed as the absence of war by a temporary ceasefire in a combat zone. To inaugurate the day, the “Peace Bell” is rung at UN Headquarters. Established by the UN resolution in 1981, Peace Day has grown to include millions of people around the world who participate in all kinds of events, large and small. As one example, award winning artist and activist, Geela Parish, delivers music with a powerful message: “Come together now before it’s too late!” She recently launched a campaign of hope and peace, called Operation Healing for the World & Giving with the Stars, featuring a charity CD song, For the Love of God. The peace song was written by Geela Parish, and has been since recorded by various artists including Patti Labelle and Liel Kolet, and was to be performed at the historic peace summit in Rome for the Pope in 2008 where Parish was also invited. Liel Kolet, an Israeli 17-year-old peace activist and singer who has sung with Bono, the Scorpions, Sir Elton John, and many more political activists and royalties throughout the world became famous when at the age of just 15 she performed the song“Imagine” written by John Lennon on Shimon Peres‘ 80th birthday and invited President Bill Clinton to sing along. “I truly believe that by leveraging the power of music, celebrities and media, it’s possible to accelerate the process by which we can affect change positively for the benefit of all humanity,” says Parish. “As we approach the International Day of Peace it’s important to carry on the work of Gandhi and Martin Luther King Jr. and recognize that everyone and everything, including the environment, is impacted by the growing threat of nuclear war and the devastating consequences of senseless violence, regardless of financial status, religion or ethnicity. It’s crucial to advance the cause of peace and non-violence because our ability to co-exist is the one condition of survival in a nuclear age,” says Parish, who is a longtime and very passionate peace advocate. “Sadly, we’re all victims of centuries of brainwashing and manipulation by those who seek to divide and conquer for self-serving purposes. It’s ignorance that divides us. We fail to recognize the spirit that connects us all and to understand the unity in all living things, like strands in the same web of life. What I think God really needs is for people who are made in His image to also act in his image,” adds Parish, whose social consciousness has always been an integral part of her transformative music and all other endeavors, including her book The American Dream and matching CD, The Veil of Life published before. What makes her campaign unique is the fact that it’s the brainchild of an American woman who originally came from a region that has never known peace, the epicenter of mindless violence, the volatile Middle East. It was an experience that has sparked Geela’s life-long passion for bringing people together and putting an end to the insanity and futility of war if only for what all religions have in common: the love of God. A significant portion of the proceeds from the sale of Geela’s song she says will be donated to victims of war-torn countries and natural disasters, such as CARE (specifically donating proceeds to rebuilding Haiti) with whom a strategic alliance is being built and The Freedom Alliance led by Sean Hannity. Many people have contributed their talents and time to create awareness of this campaign such as complementary free publicity from Atlantic Publicity, , whereas Adrienne Papp was appointment as the exclusive publicist in a letter from Geela Parish. Other mentions of the video include press releases by various online press release companies and reputable international websites such as www.univision.com; www.worldnews.com and www.videosurf.com and Atlantic Publisher. A highly professional radio station Womens Radio, is also in support of the cause along with Adrienne Papp of Spotlight News Magazine, as well as world renowned photographer, Ben Heine according to Geela Parish. Plans for the song include recording it in different genres and languages. All contributors to this cause hope this campaign will inspire celebrity personalities to come on board to create a tsunami of compassion to confront the many challenges facing all of us today, amongst them the most brutal is the self inflicted violence in certain parts of the World. Some of the consequences of war are well described in a new-release, anti-war movie, starring Colin Farrell and Paz Vega, Triage, in which a combat photojournalist played by Farrell witnesses the horrors of war first hand. The unalterable shock changes him forever and life is never the same even when back home safely in London, away from the dangers of the Middle East. I believe that one can CHOOSE to go, do, be, and have, and in the end exclaim, shocked and bewildered, that because of all the “synchronicities” of one’s life, all the clicks and coincidences, and the many happy “accidents,” bounty and good fortune must have been one’s destiny. Or, one might choose to wait for a miracle, a savior, or divine intervention, and in the end exclaim, shocked and bewildered, that because of all the “synchronicities” of one’s life, all the missed chances and disappointments, and the many unhappy accidents – poverty, misfortune, violence and cruelty must have been one’s destiny. Debra Pauli, the greatest and most truthful speaker of our times says: ” As we live and breath through this 21st Century, many are realizing that we are a crumbling universe right before our eyes. The repetitive question throughout the human race is how we transform the mindsets of all of mankind so that the flooding of peace, love and compassion become the new “universal protocol” that has been historically lying dormit for thousands of years. Who is going to step up to the plate and teach us this 3-fold lifestyle on how to accord ourselves with the ways of this world, and still remain true to ourselves, and yet reconcile with all beings of this world?” Without even questioning, Debra Pauli, has already unleashed a teaching that will wake all of us up to the most joy, and the most amazing and unbelievable transformation of the human mind, which Pauli proves is born out of hardship, not from genetic wealth or status. She shows us that hardship transforms all of us, and how to be human in a time of darkness. On the platform Debra Pauli has the ultimate powerful message far beyond what we have ever experienced or learned from other renowned speakers, teachers, and philosophers today. She connects with us on an intimate level, meeting our species on the level where we are at, at any given time, providing us with real life experiences of unbearable difficulties, filled with daily fear and terror, which she has prevailed and persevered when the odds were stacked against her in the past 48 years. She has become her own greatest power and instills in all of us that we have the same power within, the same power of choice that she has unleashed in her own life, which has made her an unstoppable force and a successful legacy never seen before. In my countless first-hand experiences with Debra, she is not only “saying and teaching” what should be done, she is actually living it! There is a world of difference ( a die, or do clarity ) in her lectures and actual manifestations in her life, which we commonly refer to as “habits” with the old vocabulary. Today I would use the word: complete transformation of the soul, a rebirth, an evolution, which is the sole purpose of life. Debra Pauli is a woman of her words. Old vocabulary is out ….we need news words, a new lexicon, like the new Century needs a way to overcome, change, and start re-inventing itself. And, in doing so, a teacher we have never seen before immerses! When we follow her words, we are okay, we “get it,” and live it ! It’s like a new identity immerses out of “the filed,” – the quantum space. Yet, it is us, it is just the next level of who we really are! “Our broken and lost souls are searching and craving the discovery of our ultimate purpose. Each of us were specifically designed and called to achieve a higher purpose through the power of our minds, through the power of choice, but now is the time that we must turn and listen to leaders and masters of this universal protocol as they are the missionaries who will teach us, guide us and inspire us” Pauli says. What she has mastered in her life is everything of what we are searching for. She teaches us how to bring “thinking and reality” into alignment through her 48 time tested “Think / Feel / Do” Lifestyle. What we are missing is Mindfulness. The World needs to finally come to its senses in order to end the senselessness by changing the way we think. And “we” means all of us, not just some of us. Let’s accept responsibility for our actions, thoughts, happiness or the complete lack thereof due to simple ignorance. A barbarian and ignorant approach will not help, but a mindful one will. Kudos to Geela Parish, Debra Pauli and all those who are rallying for the World we meant to have! About the Author of This Article: Adrienne Papp, M. Sc.and MBA is a recognized journalist who has written for many publications including Savoir, Beverly Hills 90210, Malibu Beach, Santa Monica Sun, The Beverly Hills Times, Brentwood News, Bel-Air View, Celebrity Society, Celeb Staff, It Magazine, Chic Today, LA2DAY, West Side Today among many others. She is the President and CEO of Los Angeles / New York-based publicity company, Atlantic Publicity and publishing house, Atlantic Publisher. Adrienne writes about world trends, Quantum Physics, entertainment and interviews celebrities, world leaders, inventors, philanthropists and entrepreneurs. She also owns Atlantic United Films that produces and finances true stories made for theatrical release or the silver screen. Spotlight News Magazine is owned by Atlantic United, Inc with Adrienne Papp being the majority shareholder.